Watching a knee replacement surgery video is a great way to understand more about what is going to happen during your operation. Knee replacements are the most common surgery carried out for knee arthritis. Many people are understandably nervous about the procedure and find reassurance in knowing what is going on and what to expect. We have chosen to share two different knee replacement surgery videos with you. The first is an animated version, perfect for those who are a little squeamish. The second knee replacement surgery video shows actual footage from a real total knee replacement operation and talks you through what is going on at each stage. For those of you who would like to know a little bit more about what is involved, visit the knee replacement surgery guide. This animated version from Matrix Orthopedics shows an overview of what happens during the different stages of total knee replacement surgery. It is great way to see what happens but without being too graphic - a good place to start! The video lasts approximately two minutes and there is no sound. There are a couple of things to note about the surgery shown here. Firstly, it does not show the removal of the cruciate ligaments, but this happens as part of the initial preparations of the bones. Secondly, it shows the back of the kneecap being replaced, but this is only done if there is patellofemoral arthritis. In cases where there is minimal wear and tear of the kneecap, an implant may not be required. The surgeon will simply remove any osteophytes (bone spurs) on the back of the kneecap to leave a smooth and friction free surface. 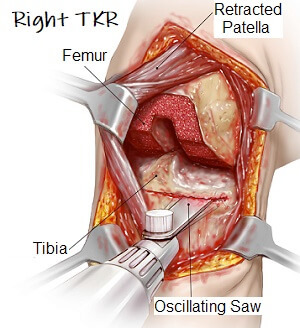 This is an excellent knee replacement surgery video for those that want to see the real thing. It shows how the surgery is carried out, the steps taken by the surgeon to ensure the minimal amount of bone is removed, the accurate placement of the prosthesis and all the steps taken to prevent infection. The actual surgery takes approximately two hours, but this video summarizes it down to around ten minutes. You get to see all the different stages of the surgery, as well as how they select the correct size implants. BEWARE: This is a graphic video - the 20 second introduction with the slightly scary sounding music makes that very clear. It is not for the feint hearted! But it really is a great video for those who want to see exactly what is going to happen. I hope you will find it reassuring to see how scientific the surgery is, how little bone is removed and all the steps taken to ensure against infection.